Once you bring home a new puppy or dog, obedience training, teaching household manners, and establishing a routine is important to maximizing happiness for both you and your new addition. Although your dog may be a warm, bundle of love, he/she may also arrive with undesirable behaviors or habits. Group classes are an excellent solution for teaching new obedience behaviors to a confident dog. Unfortunately, group class may not be an ideal venue for an anxious or fearful dog. And for safety reasons group class is unsuitable for a potentially aggressive dog that growls or lunges at unfamiliar people or dogs. Yet, all is not lost. Private instruction offers more personalized training that can move a lot faster that group class. Moreover, even for dogs with fantastic temperaments, in-home private lessons are much more effective than group class at resolving housebreaking and household manners issues. Therefore, if you own an anxious, fearful, or aggressive dog; wish to reach your goals faster; desire a customized program; or wish to focus on household behavioral issues, then private or in-home dog training lessons may be the answer. Whether you adopt a shelter dog or buy a new puppy, anxiety can be an issue that impedes progress in group class. New places, people, and/or dogs can be problematic and stressful for an anxious dog. Consequently, you and your dog may fare better if you postpone exposure to a group environment until CPT can successfully modify your dog’s behavior and improve his/her confidence via private instruction. A private or in-home dog training lesson may be exactly what your dog needs. A CPT Trainer can come to your home to provide a convenient, productive, valuable one-on-one experience. An anxious dog will feel more secure within its home environment. For such a dog, in-home private lessons will be less intimidating, more productive, and more humane. Furthermore, whereas group class has a rigid lesson plan, with private instruction your CPT Trainer can custom design a behavior modification plan targeted specifically toward relieving your dog’s anxieties. 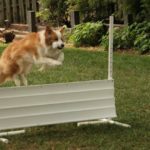 As an additional benefit, whether fast or slow, in-home dog training also progresses at a pace that is most comfortable for you and your pet. If you wish to meet 3 times per week to most quickly accomplish goals, private lessons will meet your needs. Similarly, if you wish to meet only once every 2 weeks, we can meet your schedule. Adjusting to a new puppy or dog can be challenging even in the most ideal circumstances. When nervousness is an issue, pet ownership can become more daunting. Fortunately, personal in-home dog training can help both you and your new pet adjust and thrive, so that we maximize the quality of your relationship. Private lessons should help ease nervousness and maximize training progress. Not all puppies and dogs are the same, so why train them all in a group? Thus, private or in-home private dog training may be the best solution for your nervous dog.